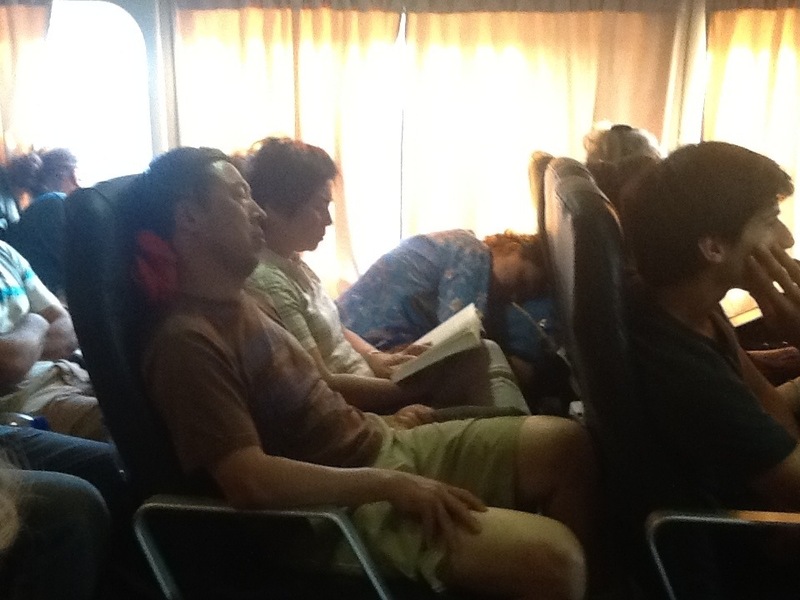 Both Yineka Mou and I are hot, sweaty, uncomfortable and cramped….and the guy sitting in a seat directly behind Yineka Mou, is violently and loudly vomiting into in a sick bag. Really nice eh! 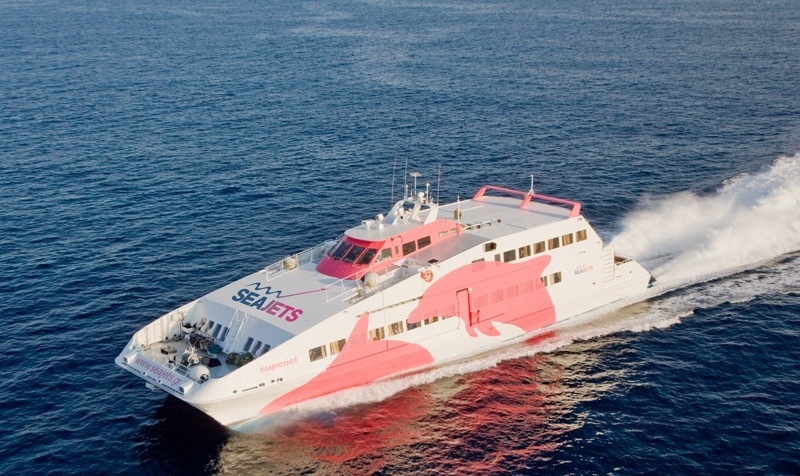 We are aboard the so called Super Jet, a high speed catamaran, which we boarded in Naxos at 3 pm this afternoon, on our way to Piraeus, via Mykonos and Syros. Unfortunately for us, on a Saturday the Blue Star Paros ferry boat doesn’t leave Naxos until 6 pm, and doesn’t arrive in Piraeus until very late, way past midnight. This boat normally only takes about 4 hours, but today they’ve just announced its running late due to inclement weather conditions ….and I’m beginning to wish we’d waited for the slow big boat. 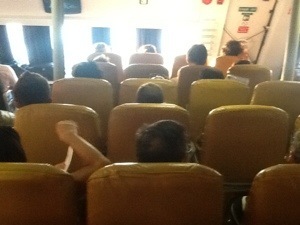 This Superjet is fully booked out, with not one seat to spare, and the sea is rough and getting rougher. We are stuck inside the lower lounge, with everyone seated in rows of aircraft type seats, (but not as comfortable) fourteen in a row, with three aisles between them, and about 30 rows. Just now , two of the crew came around handing out sick bags…great! 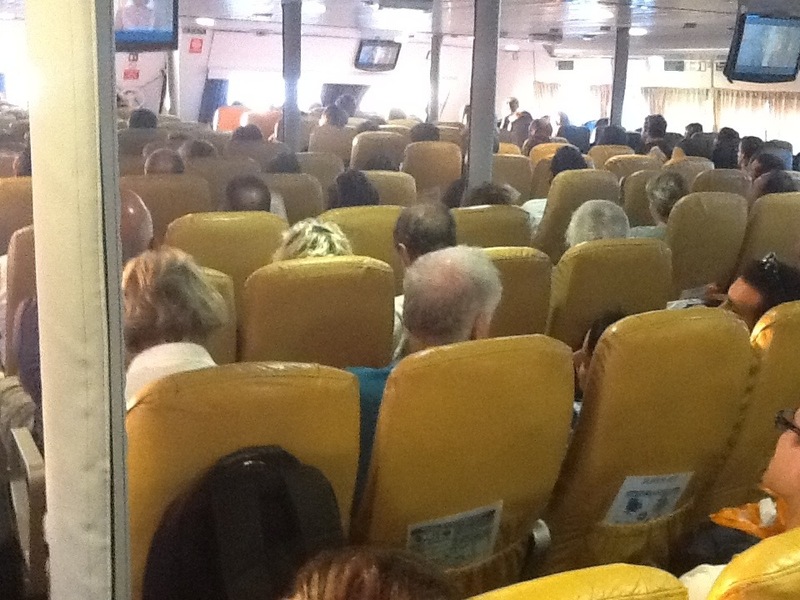 No one is allowed out on deck, you have to remain in your allotted seat for the whole voyage. The fat lady next to me ( no, not Yineka Mou) just complained to one of the crew about the heat in the cabin, and was told its because it’s hot above…meaning outside, and there were too many passengers! This is definitely not the romantic ideal of Aegean Island Hopping…( memo to self…NEVER travel on this type of ferry again) I just now walked to the toilet at the back of the boat, and it resembles a scene from a disaster movie….people lying around on the floor with their faces stuck into a bag, quietly moaning..Scattered around them is some of the luggage, broke free from the racks and rolling around with the movement of this ship. All I can think of is right now is, I’m really glad that I didn’t have the Calamari for lunch today! Footnote; We eventually disembarked in Piraeus Port at 7:55, almost an hour late. The Seajet on calm seas…don’t let it fool ya! 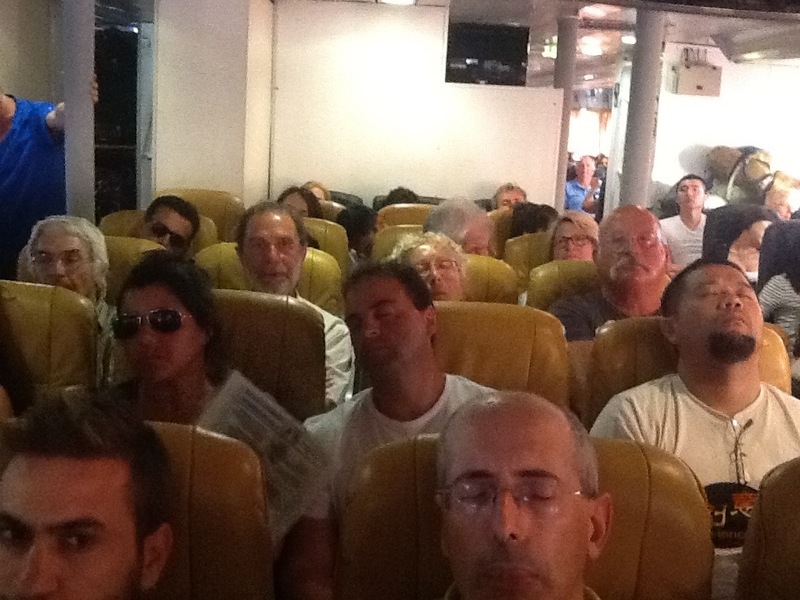 You’ve no idea how HOT it was in the cabin…the pax at far end doesnt look to comfortable.. 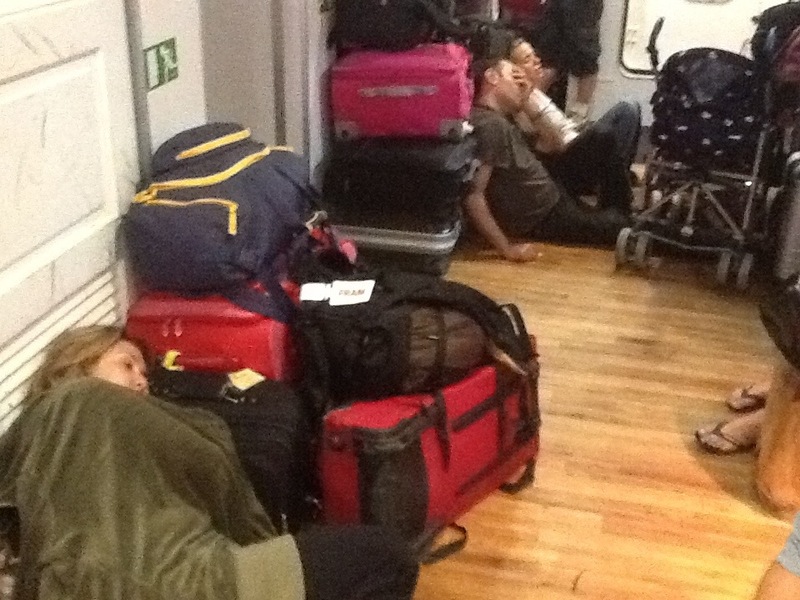 The pic of the couple says it all…Despair! Maybe Mr Jobs was programming the weather specifically for you in the Aegean that day Mr Thomas. I just remembered it’s 12 months now since you cursed his invention !